2014 wont' be an easy year, but certainly an exciting one. Many unexpected changes will keep us in high suspense. Developments could easily surge, with situations moving faster than we can think. 2014 will be dramatic in all aspects. With the January 15 Full Moon, the powerful New Year`s New Moon comes to its culmination. This first Lunar cycle has a unique signature. It signals a break from what's been before, marking a new beginning. Whatever we may see manifesting over the coming days and weeks sets the tone for many months to come. 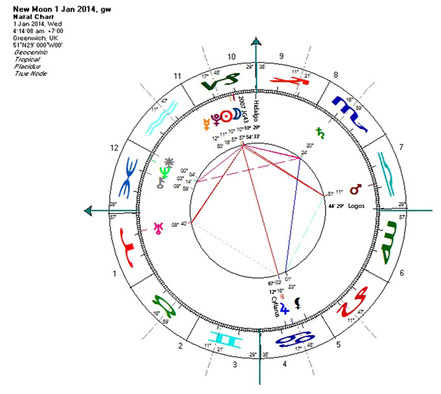 On January 15, Sun and Moon oppose each other in the 25th degree of Capricorn and Cancer. It so happens that these degrees coincide with the Moon's closest and farthest monthly passage. This is a critical location, potentially bringing darkness and difficulties to the forefront of our minds. New and Full Moons lining up with this powerful Lunar axis are considered 'crisis' Moons. As mentioned in last week's column, 2014 is a 7-year in numerology. But there's much more to it. A key signatures of 2014 is planet Saturn`s repeated alignment with Pluto and Neptune in septile configurations, spacing the three planets by sevenths of a circle. Neptune in early Pisces and hexagram 55, 'Fullness', is the leader of the formation. Pluto in Capricorn and hexagram #38, 'Opposition', trails Neptune by 51° 26'; while Scorpionic Saturn is in hexagram #43, 'Resolution', another 51° 26' behind, at the root of this sequence. Whenever Saturn resonates with Neptune we can expect the invisible to take shape and form, the concealed and disguised to be seen in clear light. There's a great story to this: Neptune could have been found two and a half centuries earlier. While watching Jupiter's moons, Galileo Galilei made note of two close-by stars which seemed slightly further apart on the subsequent night. Had he followed up observing the couple for some more nights, he would have discovered Neptune. However Galilei is not the only one to have missed the opportunity. Later observers too stumbled across Neptune without understanding what it really was. Among them was the skilled French astronomer, Lalande; English astronomer, John Herschel; and Scottish astronomer, Von Lamont. As it turned out, Saturn's help was necessary in order to recognize this elusive guy. 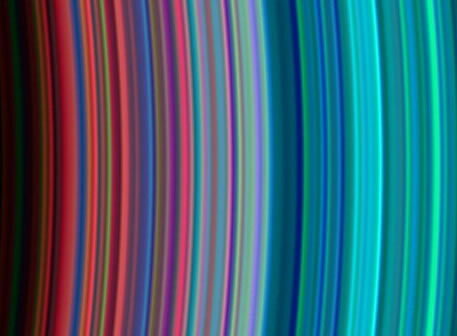 On September 23, 1846, when Galle's assistant D'Arret (French for "arrest") realized he had captured a moving object, the mesmerizing blue gas planet was conjunct planet Saturn. 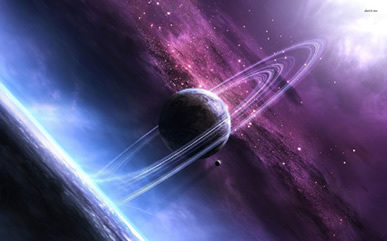 The present Saturn-Pluto-Neptune septile indicates that the revelation of profound, sensitive and challenging material is gaining momentum as the year proceeds. Pluto's role, standing between Saturn and Neptune, is particularly critical. It indicates the disclosed information catapulted into the public eye, challenging the prevailing power structure. Magnitude and authenticity of the information will make it impossible for main stream media to black it out or push it under the carpet. We have no idea yet how much the world will change in the wake of Edward Snowden's courage, to above all be true to himself. He's a beacon, encouraging others to stand in their own power too. As stated on Wikipedia, by November 2013, one percent of the sensitive material was published, with "the worst yet to come". Even the potential release of top-notch secrets could act like a truth serum. The sheer threat of exposition could correct certain excesses. All of a sudden everything is becoming possible. Corpses could be unearthed, powerful lies debunked once and for all. Some public figures may already be preparing to step forward, out of the dark, admitting to what has been concealed. After Mars is over with its retro loop, between May and the end of July 2014, radical changes may start setting in. The needle will cross the zero line, from the minus to the positive. It will feel like a mighty river`s ice shield breaking up, a natural spectacle of breath taking suspense. After all, Pluto and Saturn are in each other's sign, in a feedback loop, empowering one another. You certainly would agree, the year of 2008 changed the tone of our world dramatically. Pluto had entered the sign of Capricorn. Many astrologers had predicted that between 2008 and 2023, power structures would get radically shaken and transformed. Let's zoom in one more time on Neptune, the final recipient of this configuration`s dynamic progression. Until March 2015, Neptune occupies hexagram #55, 'Fullness', indicating a time of expansion and abundance, highlighting spirituality, empathy and oneness. 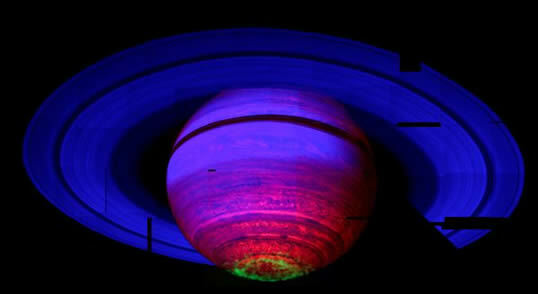 The critical ingredient for this subtle energy to leave a lasting impression is Saturn, giving structure and discipline. Possible pit falls are ambition and pride which dim the brightness of our minds. As challenging as Saturn can be, and even more so in unforgiving Scorpio, if we embrace this reality check, daring to look into the devil`s eye, there could be some radical changes upon us. The promise of a possible breakthrough comes from hexagram #43, which says: "Resolution dissolves evil forces." We should remember to be patient and not engage in hasty and premature actions. Cooperative and virtuous energies are gaining ground. Things fall in place when we connect with our hearts. The magic touch for such a transformation comes from Jupiter, and its favorable placement in Cancer. It`s reminding us of our common roots, provides nourishment, and makes us aware of the fact that we are one big family, and that we`re sharing the same home. On Friday, Jauary 11, Venus was passing exactly between Sun and Earth, starting a new Synodic cycle. Over the next few days Venus separates from the Sun and after January 16, Venus will reappear, now as morning star. Bruce Scofield`s research shows, these days after Venus` rebirth to be highly critical. No other period in Venus` 584-day cycle has such an affinity to provocation, social upheaval, revolutions, assassinations, etc. The Gemini Moon's void-of-course period began yesterday, Sunday, at 2:30 p.m. MST. It's lasting 'til 5:30 p.m. MST today, when the Moon enters Cancer. It's best to lay low and be extra careful during periods of potential confusion and disorientation. Confirm appointments beforehand, make sure everyone is on the same page. When we`re prepared for things to go sideways, situations can be contained before they get totally out of hand. Full Moon is here. Be respectful to its blazing intensity, roll the red carpet out. As mentioned above, this Full Moon is a fractal of the year 2014, a self-similar pattern, the year`s essence in a nutshell. Mercury in Aquarius favors a rational and scientific approach, however the soaked Cancer Moon is in for some clashes. Thailand`s capitol Bangkok might be the epicenter, or at least one of them. Full Moon in Bangkok brings Eris to the Ascendant, while retrograde Venus is high up in the zenith. Protesters asking for more democracy might bring the government to its knees. A new era might begin for the only country in Southeast Asia that never had been colonized by a European power. - Red Crystal Earth, what a shaker this day can be! The big earthquake of March 11, 2011, which triggered the terrible tsunami and the following meltdown of three nuclear reactors occurred on this day, 4x260 days ago. The Moon enters Leo by 6 a.m. MST. A few hours later Mars squares Venus. Even most difficult problems can be approached when we cooperate. Listening carefully you will know, there`s high subtle guidance, everything unfolds according to a great plan. We can move away from conflict by giving creative expression to our thoughts and emotions. Think about it: Nothing is only good, and there`s nothing that`s purely evil. The Yin-Yang symbol reveals it, within the good hides the seed of the wicked, and evil holds a grain of light. White Cosmic Mirror is one of these rare days when the veil opens. Maybe only for a split second, however the glimpse is clear, it comes from timeless dimensions, form the inner space where we are who we are, where there`s no coming or going. Surrender to what is, and there will be peace. Six days ago a new Venus cycle began (see intro). However, planet Venus is still moving backwards, for another two weeks. Friday early morning, short before sunrise you might be lucky catching the first faint glow of the freshly born morning star. Venus began moving backwards on winter solstice, December 21, 2013; only hours passed the yearly midnight point. A particular side of this retrograde Capricorn Venus is that it happens too easily that our expectations and reality are far apart from each other. Love relationships may get tested, we may ask ourselves what kind of attraction we generate, and also what kind of attraction we draw in. While this will prove being an incredibly insightful time, it isn`t the best period to look out for a new partner. If you are with someone, keep in mind to refrain from blaming. Really watch your emotions, what type they are, and by what they are triggered. Realize, who we see isn't necessarily the other person , but our perception of who they are. Take in account that vision could be slightly distorted. - Blue Magnetic Storm is a strongly interactive force. Polarities are meeting and merging, intimately exchanging energies. We may inspire one another. And we may be surprised by the deeply formative powers chaos holds. It says, out of chaos stars are born. Contradiction and paradox are trademarks of Storm (Cauac). This day sets the key for the coming thirteen days, till January 29. Until 6:23 p.m. MST, the Moon is void-of-course in Leo, then it moves on into the sign of Virgo. Leo Moons tend to be colorful and dramatic. As long as it`s a fun experience everything is as good as it can be, otherwise take it with a grain of salt. If you can afford, this would be the perfect day to take off and relax, enjoy the great outdoors, recharge your battery. Yellow Lunar Sun is a gateway for higher frequencies to descend. Being thankful for what has been, remembering those who came before creates an opening for new inspirations. The Sun is in the last degree of Capricorn, changing into Aquarius around 9 p.m. MST. As a rule of thumb, last and first degrees are deemed critical. Areas of phase transitions give the perfect conditions for eddies and vortexes to form, giving the impression of some sort of urgency. The Virgo Moon boosts our analytical minds, we may see things in a bigger context, recognizing aspects we might have overlooked, issues that need our attention. Red Electric Dragon is full of pioneering spirit and initiatives. The batteries are fully charged, we`re ready to venture out and explore new territory.